RB26DETT rebuild, overhaul, reinforcement and improvements. 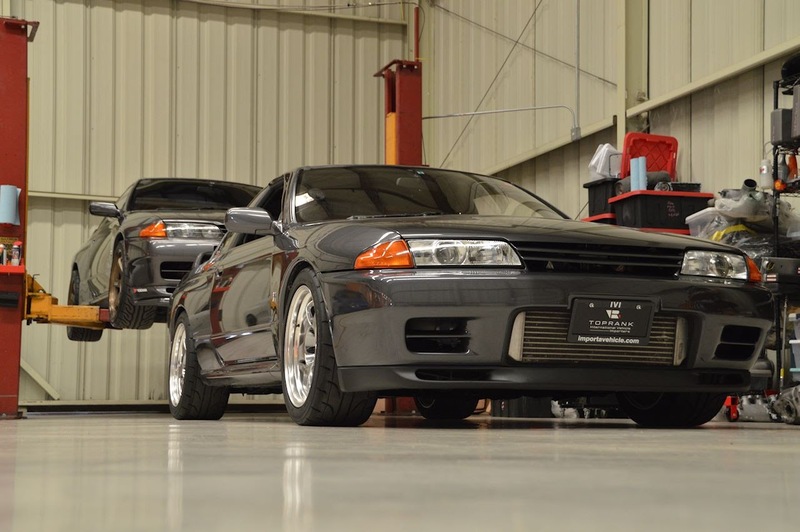 Nissan Skyline GTR R32. 23.January to 30.April 2016. This is a short video edited down to 27 minutes. The engine was in good condition, but I wanted and improve the engine to withstand stress during race track and drag race. Engine block was drilled up to the new 86,5mm pistons and surface grounded. Cylinder heads were also surface grounded. Mounted Tomei 1,5mm oil restrictor to decrease the amount of oil to the cylinder head, which again leads to increased amount of oil in the oil sump. Made an extra oil return from the rear of the cylinder head, with a return hose below oil level in the sump, so that the oil flows faster down to the sump, and cannot be pumped up again (siphon principle). Mounted new Nismo main and rod bearings that are a little stronger than the original bearings. Oil clearings where all checked to 0,038mm. Thrust bearing clearance checked to less than 0,1mm, more than 0,05mm. New CP Carrillo 86,5mm forged lightweight pistons and Eagle forged H-beam rods with ARP 2000 rod bolts. Piston rings where filed to the correct gap, according to the sheet that came with the pistons: 1st ring 0,45mm , 2nd ring 0,55mm , oil rings 0,35-0,45mm. Re-used the Tomei Pon cams, 269 in and 252 ex, both with 8,9mm lift. Valve clearance where checked to 0,4mm in and 0,35 ex. Re-used the Nismo oil pump. I measured a total clearance to the crankshaft drive of 0,35mm (0,175mm on each side). Hope, and think, this is good enough for this power when keeping the rev limiter to max 8000rpm. New original NPT water pump. New ARP studs to keep the cylinder head and gasket tight. New Tomei metal head gasket with 1,5mm thickness (0,3mm over size) to keep the original compression ratio. New Tomei intake manifold metal gasket, throttle body metal gaskets and exhaust gaskets. Re-used the Greddy Grex oil cooler and oil cooler sandwich with thermostat. Re-used the HKS exhaust manifolds, but had to re-weld them because of cracks. Re-used the HKS 2530 ball bearing turbo’s. New Gates Racing timing belt, idler and tension wheel. Also see how I centred the CAS and CAS bracket in the "7: Timingbelt" -section. This is important. If not in centre, it could lead to bearing failure in the CAS or even crack. Filled oil in the oil pick-up to check the oil feed to the bearings, cylinder head and turbo’s. Oil pan where custom made to increase the oil amount about 1,7 litters, like “wings” on both sides. They do not go all the way down, to make the oil pick-up the lowest place in the sump. Also mounted Nismo baffle plates to keep the oil where the oil pick-up is, to prevent the oil pump sucking air which could lead to catastrophe. Re-used the OS Giken triple plate clutch and flywheel. Re-used Greddy large intercooler and piping, Apexi Power FC ECU, Apexi boost control valve, Greddy / Denso 720cc injectors, 2 x 300ZX Z32 MAFS, Greddy air filters, ground wiring kit and Apexi exhaust system.